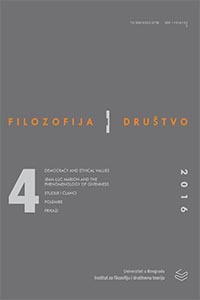 The aim of this paper is to explore the relation between democratic values and emotions. The author argues that democratic values and emotional judgments are inter-reducible: political agents use emotional judgments to re- flexively evaluate normative paradigms of political life. In the first part of the paper, the author describes the state of emotions in contemporary political philosophy and identifies Charles Stevenson’s ethical conception of emotivism as the first comprehensive attempt to neutrally conceptualize emotions in mor- al and political thinking. The second part of the paper explores the shortcomings of emotivism and finds an adequate alternative in Martha Nussbaum’s concept of emotional judgment as the one that contains beliefs and values about social objects. In the final part of the paper, the author identifies that moral and polit- ical disagreements emerge in democracies from ranking of the importance of political objects. The evaluation criteria for this type of ranking is derived from democratic values which are reducible to agents’ emotional judgments. Arendt, Hannah (1978), The Life of the Mind, Vol. II. San Diego: A Harvest Book. Aristotel (1980), Nikomahova etika. Beograd: BIGZ. Aristotel (2008), Rasprava o duši. Podgorica: Unireks. Baron-Cohen, Simon (2013), Zero Degrees of Empathy: A New Theory of Human Cruelty. London: Penguin Books. Bedford, Errol (1964), “Emotions”, in: D. Gustafson (ed. ), Essays in Philosophical Psychology. London: MacMillan, pp. 77–98. Calhoun, Cheshire (2004), “Subjectivity and emotions” in: R. Solomon (ed. ), Thinking about Feeling. Oxford: Oxford University Press, pp. 107–124. Castañeda, Hector-Neri (1967), “Ethics and Logic: Stevensonian Ethics Revisited”, The Journal of Philosophy 64 (20): 671–683. Diamond, Larry (1999), Developing Democracy. Balimore and London: The John Hopkins University Press. Elster, Jon (2004), “Emotion and action”, in: R. Solomon (ed. ), Thinking about Feeling. Oxford: Oxford University Press, pp. 151–162. Freeden, Michael (2015), The Political Theory of Political Thinking. Oxford: Oxford University Press. Gilbert, Margaret (2014), “How do we feel: understanding everyday collective emotion aspiration”, in: C. Scheve and M. Samela (eds. ), Collective Emotions, Oxford: Oxford University Press, pp. 17–31. Gillard, Julia, “Julia Gillard writes on power purpose and Labor’s future”, (internet) available at: https://www.theguardian.com/world/2013/sep/13/julia-gillard- labor-purpose-future/ (viewed 13 October, 2016). Helm, Bennet (2007), Emotional Reason. Cambridge: Cambridge University Press. Kecmanović, Dušan (1999), Psihopolitika zla. Beograd: Prosveta. Kecmanović, Nenad (2008), The Reaches of Democracy. New York: Humanity Books. Moor, Asher (1957), “Emotivism: Theory and Practice”, The Journal of Philosophy 55(9): 375–382. Nussbaum, Martha (2004), “Emotions as Judgments of Value and Importance”, in: R. Solomon (ed. ), Thinking about Feeling. Oxford: Oxford University Press, pp. 183–199. Pantić, Dragomir (1995), “Tradicionalizam i autoritarnost kao prepreke za razvoj civilnog društva u Srbiji”, in: V. Pavlović (ur. ), Potisnuto civilno društvo, Beograd: Eko centar, pp. 51–70. Solomon, Robert (1976), The Passions. New York: Anchor Press. Solomon, Robert (2007), True to Our Feelings. Oxford: Oxford University Press. Stevenson, Charles (1958), Ethics and Language. New Haven: Yale University Press. Stojanović, Svetozar (1991), Savremena meta-etika. Beograd: Zavod za udžbenike i nastavna sredstva. TenHouten, Warren (2007), A General Theory of Emotions and Social Life. London: Routledge.